We would like to notify you that the <2014 Kim Jaejoong 1st Album Asia Tour Concert in Daegu> concert, which was set to be held on the 18th of January, has been cancelled due to unforeseen internal circumstances. We would like to send our sincerest apologies to the many fans who were waiting for the concert. Kim Jaejoong plans to hold his nationwide tour on the 4th of January in Busan, on the 11th in Gwangju, and on the 25th and 26th at Korea University’s Hwajung Gymnasium in Seoul. We promise to bring him back to you as soon as we can, and we would like to once again thank the fans for their love and support. 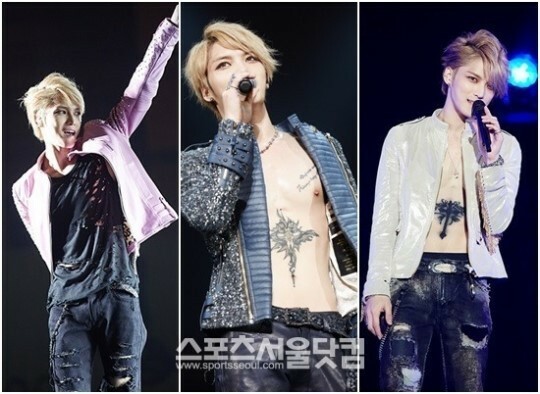 Having successfully held the Osaka leg of his Asia tour on the 17th and 18th of December, Kim Jaejoong is in the spotlight for his special concert outfits. Kim Jaejoong designed the clothes he wore during his Asia tour, which took him to Thailand, China, Hong Kong and Taiwan this year. He had two more leather jackets created for his Yokohama and Osaka concerts, reflecting his passion to be as involved as possible. Kim Jaejoong released his mini-album ‘I’ and full-length album ‘WWW: Who, When, Why’ this year, taking his first steps as a solo singer. His shocking visuals and rock music separated him from his JYJ activities, and won the hearts of the public. Having proven his popularity all across Asia through his tour, Kim Jaejoong will be returning to Korea in January to embark on his nationwide tour. Blessing Yoochun, the ‘noonas and aunties’ fansite of JYJ’s Park Yoochun, are drawing the attention of many for making a donation of 20,000 briquettes. Famous for their previous projects that set up a Park Yoochun cherry blossom road in Incheon and a Park Yoochun library in a small island town, Blessing Yoochun has made a meaningful donation to celebrate the star’s 10th anniversary. In order to celebrate Park Yoochun’s 10th anniversary, which will be the 26th of December, Blessing Yoochun collected a total of 10 million Won to donate a total of 20,000 briquettes. On the 21st, the members of the fansite gathered to hand out the briquettes to those in need in Seoul. They lined up in streets that were too narrow for cars to pass through, and passed the briquettes between each other so they could deliver the donations. Though most of them had never done such volunteer work before, they had smiles on their faces as they shared their love and support. Meanwhile, Park Yoochun is currently filming for director Bong Joon Ho’s ‘Sea Fog’, in which he plays the role of Dong Shik. The star will also appear in ‘Three Days’ next February, teaming up with PD Shin Kyung Soo and screenwriter Kim Eun Hui. Park Yoochun’s deep-seated affection for SBS’ ‘Three Days’ played a large role in ensuring his appearance in the drama. The representatives of ‘Three Days’ approached him with an offer to appear in the drama, and had since worked with the star’s agency to schedule all his activities. However, Park Yoochun’s acceptance to appear in Bong Joon Ho’s movie ‘Sea Fog’ meant that more negotiations had to be made so that he could appear in both productions. However, ‘Sea Fog’ required a great deal of filming in the middle of the ocean and though all filming was initially planned to be completed by the end of this month, a variety of circumstances surrounding ‘open movie sets’ pushed the date back. The filming schedules of the movie and the drama ended up overlapping, meaning that there was a possibility that Park Yoochun might have to give the drama up. On top of this, the airing date of the drama became unclear as SBS and the production company couldn’t come to an agreement. Luckily, the drama’s schedule was confirmed, and Park Yoochun was able to move his schedule around to fit the requirements.